The legendary camera designer Yoshihisa Maitani (1933–2009) was responsible for the Olympus OM 35 mm SLR system, and one of his goals was to produce an unrivalled system of accessories for close-up and macro photography that extended into photomicrography. 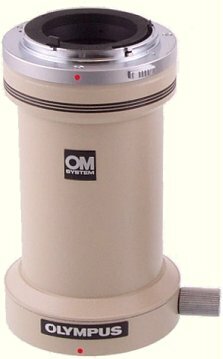 The Olympus OM system was in production for such a long time (1972–2003) that it was used with 4 generations of Olympus compound microscopes: EH/FH, BH, BH-2 and BX. The BH-2 was the model that cemented Olympus’ position as one of the top 4 microscope manufacturers, and Maitani ensured that his OM cameras could be used with a trinocular BH-2 by adding just a clear focusing screen, a photo eyepiece and a simple camera adapter. The OM film cameras are now obsolete, but simple lens adapters allow Canon EOS, Sony NEX, Four Thirds or Micro Four Thirds digital cameras to be used instead, bringing good-quality digital imaging to the BH-2 microscopes. Alternative camera adapters allow Minolta, Nikon, Pentax, Sigma, Sony α and other digital SLRs to be used. Any trinocular version of the BH-2 compound microscope is suitable, including the BHS, BHT and BHTU biological models, the BHSP and BHTP polarising models and the BHM, BHMJ, BHMJL and BHSM metallurgical models. The BH-2 microscope was discontinued around 1993, and so most of the items referred to on this page (including the Photomicro Adapter L, the NFK photo eyepieces and the BH2-TR30 trinocular head) have also been discontinued. The best places to find them are eBay and microscope dealers who sell used equipment. 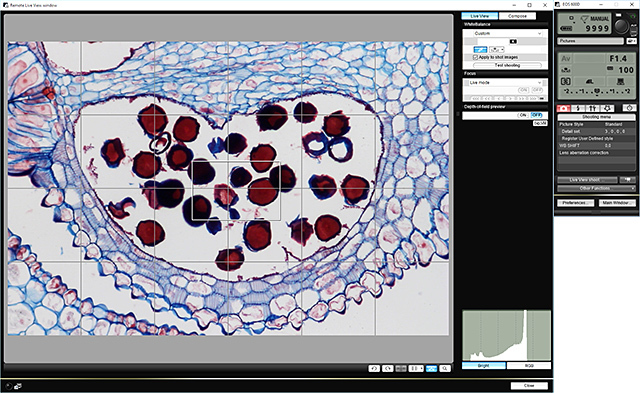 Remote control software makes photomicrography much easier. Instead of peering through the viewfinder or using the small LED screen on the camera, you can use your computer to check focus, compose, set white balance, adjust exposure and take the photograph. Focus stacking software increases depth of field, which often makes photographs appear sharper. You do not need a lens on the camera, because the photo eyepiece is designed to project an image directly onto the sensor. The best digital SLRs to use as replacements for an Olympus OM have a 36×24 mm full-frame sensor, for example the Canon EOS 5D Mark II, 5D Mark III and 6D, allowing you to carry on using the same NFK 2.5× photo eyepiece and 35 WHK 10×/20 L finder eyepiece. A cheaper option is a digital SLR with an APS-C sensor (22.2×14.8 mm), such as the Canon EOS 7D, 40D, 50D, 600D (Rebel T3i) and 1100D (Rebel T3), but the smaller sensor results in a significantly smaller field of view unless a very expensive NFK 1.67× photo eyepiece is used. It is possible to use digital cameras with a Four Thirds sensor (17.3×13.0 mm), but even with an NFK 1.67× photo eyepiece the camera’s field of view is substantially smaller than the viewing eyepieces. Vibration from the camera’s mirror and shutter can be a problem when taking photographs through a microscope. Traditional solutions include electronic flash, long exposure times, mirror pre-release, and stands that support the camera independently of the microscope. Canon EOS digital cameras from the 5D Mark II, 7D, 40D, 450D and 1000D onwards have a Live View Silent Shooting mode that makes them particularly suitable for photomicrography. In this mode, vibration is almost eliminated, because the exposure is started electronically while the mirror is already raised and the shutter is already open. This is also referred to as EFSC or electronic first shutter curtain. EOS cameras also come with EOS Utility software that allows the camera to be controlled via a USB connection from a computer, allows the computer screen to be used for checking focus and composition, and allows images to be saved directly to the computer. The camera body is connected via a lens adapter to the camera adapter. The lens adapter connects the camera body to the camera adapter, and ensures that the digital sensor is located in exactly the same plane as the film in an OM camera. For Canon EOS camera bodies, new lens adapters are readily available on eBay to enable these bodies to be fitted to the top of the Photomicro Adapter L instead of an Olympus OM camera. These adapters convert the OM bayonet on the Adapter L to an EF bayonet, and exactly compensate for the 2.0 mm difference in registration between OM and EOS bodies. For Sony NEX, Four Thirds and Micro Four Thirds camera bodies, new lens adapters are readily available on eBay to enable these bodies to be fitted to the top of the Photomicro Adapter L instead of an Olympus OM camera. For Minolta AF/Sony α camera bodies, there are new adapters on eBay that might be suitable for use with a Photomicro Adapter L. The adapters are thick but they include a lens, so they might allow OM lenses to focus to infinity; if this is the case, then they probably are suitable. For Canon EOS, Minolta, Nikon, Olympus E, Panasonic, Pentax, Sigma, Sony α, Sony NEX and other camera bodies, new T-2 lens adapters are readily available on eBay to enable these bodies to be used with alternative camera adapters that have a T-2 fitting on top. 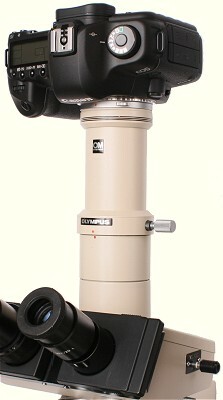 Olympus produced the Photomicro Adapter L to allow their Olympus OM 35 mm film cameras to be used for photomicrography with trinocular versions of their BH-2 compound microscopes. Lens adapters are easily available on eBay to convert the OM rear lens fitting on the top of the Adapter L so that Canon EOS, Four Thirds and other shallow-bodied cameras can be used instead of OM cameras, with the digital sensor located in exactly the same plane as the film. The bottom of the Adapter L clamps on to the circular dovetail on trinocular heads for BH-2 microscopes. The Adapter L was originally finished in grey to match the BH microscope. The finish was later changed to cream to match the BH-2 microscope. If you want to use a Nikon, Pentax or other deep-bodied digital SLR, it is not easy to convert the Adapter L, but there are at least 3 sources of alternative adapters that attach to the Olympus 38 mm circular dovetail at the bottom and take a T-2 mount at the top. I have not seen any of these adapters, so please contact the manufacturers to ensure that they are suitable. 1) Richard J. Kinch (Olympus 38mm Dovetail to T-mount Adapter) makes an adapter that maintains the proper 150.0 mm distance from the lip on which the top section of an NFK eyepiece rests to the plane of the sensor. 2) Martin Microscopes produce their MBH2T adapter; this is not listed on their website so you need to contact Martin Microscopes. 3) Diagnostic Instruments used to produce their PA1-10A adapter. To project the image produced by the objective onto the sensor in the camera body, special photo eyepieces that sit inside the circular dovetail on the trinocular head are used, not the viewing eyepieces. 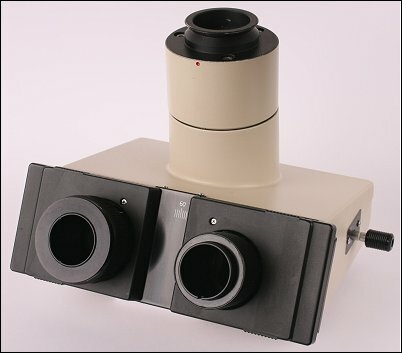 The NFK photo eyepieces were designed for photomicrography with the LB or long barrel objectives that were supplied with the BH-2 microscope, including the DPlan, SPlan, SPlan Apo, MSPlan and Neo SPlan ranges. These objectives have a 45 mm parfocal distance. For digital SLRs with a full-frame sensor (36×24 mm, diagonal 43.3mm), such as the Canon EOS 5D Mark II, 5D Mark III and 6D, the most appropriate photo eyepiece is the NFK 2.5×. 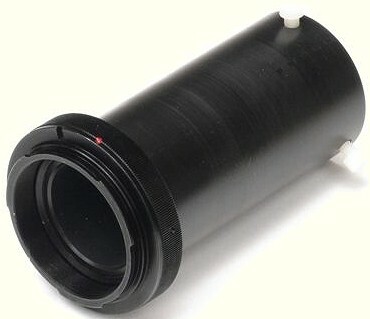 With a 10× objective and WHK 10×/20L eyepieces, the field of view is 1.98 mm diameter. With a 10× objective, an NFK 2.5× photo eyepiece and a Canon EOS 5D Mark II, the diagonal field of view is 1.74 mm, and the rectangular field of view is 1.45 × 0.97 mm. For digital SLRs with an APS-C sensor (22.2×14.8 mm, diagonal 26.7mm), such as the Canon EOS 7D, 40D, 50D and 550D, the most appropriate photo eyepiece is the NFK 1.67×. Unfortunately, these are uncommon and expensive. The NFK 2.5× can be used, but the small sensor significantly restricts the field of view. For digital SLRs with a Four Thirds sensor (17.3×13.0 mm, diagonal 21.6mm), the most appropriate photo eyepiece is also the NFK 1.67×, but the small sensor means that the camera’s field of view is substantially smaller than the viewing eyepieces. 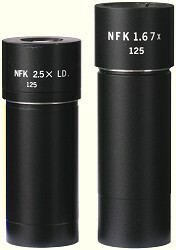 The NFK 3.3×, 5× and 6.7× photo eyepieces can be used when higher magnification (with a correspondingly smaller field of view) is required. None of the photo eyepieces can cover the field of view through the BH2-SWTR30 superwide trinocular head. Olympus made 10× finder eyepieces that are used in the right-hand eyepiece tube and show the rectangular field of view for the NFK 2.5×, 3.3×, 5× and 6.7× photo eyepieces with 35 mm film, and of course these work perfectly with full-frame digital SLRs. 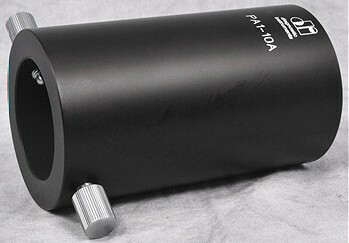 A normal viewing eyepiece is used in the left-hand eyepiece tube. There were 3 versions, for the WHK, WK and SWHK series of eyepieces. The WHK version is marked 35 WHK 10×/20 L, the WK version is marked 35 WK 10×/20 L and the SWHK version is marked 35 SWHK 10× L.
There is a small locating screw that fits into a slot in the right-hand eyepiece tube and prevents the lower part of the eyepiece from rotating. This is necessary to stop the rectangles being rotated out of alignment with the camera, and to allow the top part to be rotated for focusing. The finder eyepieces include double cross hairs; rotate the top part of the eyepiece until you can clearly see the fine double lines of the cross hairs. Once this has been done, the subject plane that is in focus at the same time as the cross hairs will also be in focus on the film or sensor. The finder eyepieces can be convenient, because they let you check what the camera will see without moving your head to look through the camera or at the computer screen, but they are not essential. Trinocular heads have a pair of inclined tubes for binocular viewing plus a third vertical tube that takes an NFK photo eyepiece. Three trinocular heads were made for the BH-2 microscope, and they all incorporate the 38 mm circular dovetail for attaching a camera adapter. The common trinocular head is the BH2-TR30. The other heads are the superwide BH2-SWTR30 and the tilting BH2-TTR, which are uncommon and very expensive. With the BH2-TR30 and BH2-TTR trinocular heads, the image seen through the right viewing eyepiece should automatically be in focus at the same time as the image on the sensor of the digital camera. The viewing eyepiece tube for the right eye is not adjustable, and has a slot for aligning a finder eyepiece. The viewing eyepiece tube for the left eye is adjustable, so that the image seen through the left eyepiece can be brought into focus with the view through the right eyepiece. If the image seen through the right viewing eyepiece is not in focus at the same time as the image on the sensor of the digital camera, try to obtain an eyepiece that was intended for use with a removable graticule. These have a focusing helix that was intended to make sure that the markings on the graticule could be seen clearly, but without a graticule they can be used to make the camera and the right eyepiece parfocal. First focus the image from a low-power objective seen through the camera. Then, without touching the microscope’s coarse or fine focus knobs, adjust the right eyepiece to bring the image into focus. Then adjust the left eyepiece tube to bring the image into focus. Suitable eyepieces are marked -H, for example WHK 10x/20 L -H or WK 10x/20 L -H.
On the BH2-SWTR30 superwide trinocular head, both eyepiece tubes are fixed but the superwide eyepieces incorporate dioptric adjustment. To make the viewing eyepieces parfocal with the camera, first focus the image from a low-power objective seen through the camera. Then, without touching the microscope’s coarse or fine focus knobs, adjust the left and right viewing eyepieces to bring the images seen through the eyepieces into focus. Trinocular heads for the BH microscope can be used on a BH-2, but they need a PM-ADF eyepiece adapter to provide the circular dovetail. To make the best use of a digital SLR, you need to abandon the way you worked with 35 mm film. 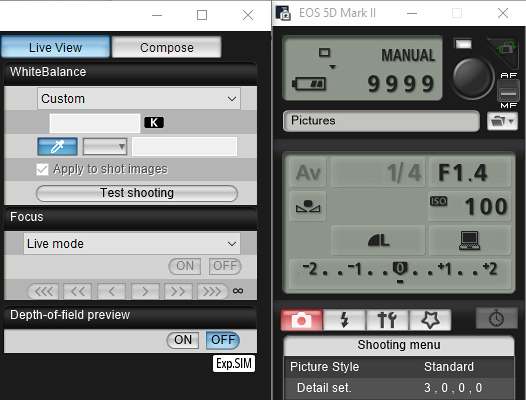 Remote control software such as EOS Utility for Canon digital SLRs lets you connect the camera to the USB port of the computer. Then you can display the image from the camera’s sensor on your computer screen so that you can check focus, compose, adjust white balance and exposure, and take the photograph. Images are stored on your hard drive. There is no need to touch the camera except to turn it on and off. Using the camera this way drains its batteries quite quickly, so it is a good idea to use a mains adapter. A common problem when starting photomicrography is a perceived lack of sharpness in the photos, compared with the view through the binocular eyepieces. Often, the cause is not a fault with your equipment or technique, but shallow depth of field. The solution is to take a series of photos focused at different points, and then use focus stacking software that selects the sharpest parts of each image and combines them to produce an image with good depth of field. The two most popular stacking programs are Zerene Stacker (the one that I use) and Helicon Focus. The following table summarises the best options for various combinations of cameras and microscopes.